If you have tons of money to blow and a family member with a love of expensive shiny gadgets, you’re in luck. 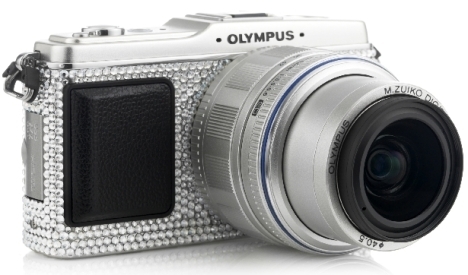 It turns out Olympus decided to jump on the shiny bandwagon and create their very own Swarovski covered camera. Some might have thought that the camera looked great without being covered in a bunch of frivolous shimmery rocks, but then again those people probably don’t have the cash for this anyway. Most people these days have to save up just to afford a decent quality normal camera, much less a good camera that’s covered in expensive crystals. The Olympus Pen E-P1 is limited edition from Harrods and comes with two different lenses. They aren’t bothering to list what type of lenses though. Perhaps they believe those that buy shiny cameras aren’t really concerned about the details. You can purchase this camera for the low price of £1999.99. For those curious, that translates into $3,315.